She was 5-foot-2 with auburn hair and an infectious smile. She was a senior at Farmingdale High School, I was a junior. We were crazy about each other. So I did. I jumped into an unforgettable summer. 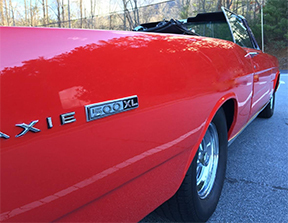 Cruising down Main Street in the convertible, or heading for the beach, or parking at a drive-in movie —it was all pure, major-league magic, the type of real-life fairy tale that adolescents fail to appreciate until it’s buried in the shuffle of passing years. In September, my girlfriend left for college. We stayed in touch, and I’d see her when she was home for vacation, but distance grew decisive. The last I heard, she had married a fellow student. Years later, in the early 1980s, my wife, Portia, was in Huntington Hospital for minor, outpatient surgery. As I stood waiting in the empty two-bed recovery room, I noticed a name on a card at the end of one bed. Pause. Nah, no chance. I’d have bet a million dollars on it. I would have lost. I immediately recognized the unconscious and familiar face of a female patient being wheeled in, followed shortly by my own still-sleeping wife. What were the chances? Stunned, I sat in a chair facing the two women — one a serious high school girlfriend, the other, a you-can’t-get-more-serious-than-that wife. I looked from one to the other for two full minutes, and when both seemed to be waking up, I resorted to the most adult behavior I could think of: I ducked into the bathroom and closed the door. This was totally nuts, and even worse, why was I feeling guilty? I hadn’t done anything. In a hurried, and for some reason nervous, manner, I explained the situation to my now-conscious wife. The curtains opened, and the four of us chatted awkwardly. The former girlfriend, her husband and their two children lived in the Huntington area, 15 minutes from us. It was that simple, that complex. As my wife and I walked to the car, she suggested the four of us have dinner. I considered it, then declined. The other woman was someone I knew in the golden era of youth. I wanted to remember her as she was at a time before the old grade school was demolished to make way for a mega grocery store, a time when the Yankees were still legend, a time before my best friend, whom I had known since third grade, was cut down on a foreign battlefield. I needed to preserve what was magical, and somehow forget what was not. I’m not sure why. What struck me was how the summer from decades before remained etched in my memory, while the chance meeting in the hospital had begun to fade. Faraway was close. Close was far away. And, of course, some things hadn’t changed. 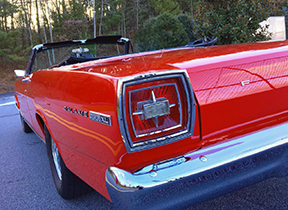 In the parking lot, I unlocked the red 1966 Galaxie convertible I’d purchased years before. After opening the door for my wife, I stepped inside, glanced over my shoulder and smiled, then headed home. Ted Alexander lives in Asheville. His novels, “The Fall of Summer” and “After & Before” are available at Malaprop’s Bookstore/Café and online book retailers.